Since its introduction in the 1980s, several different laser vision correction treatments were developed, each with its own unique characteristics, advantages and disadvantages. The treatment techniques include PRK, Lasik, Smile and variations on each of these themes. Since many different variables will determine the optimal type of laser treatment for your particular set of circumstances, the preferred procedure for each eye can only be decided after a thorough examination. With about 20 years of experience in the field of corneal refractive laser corrections, Dr Potgieter is uniquely qualified to recommend and perform the type of procedure that will give you the best possible outcome. For more information on the different laser treatment techniques, click on one of the links below. PRKPRK is one of the laser treatment options to restore vision by permanently reshaping the cornea with an Excimer Laser. See Laser Vision – PRK. is the acronym for Photo Refractive Keratectomy. It is the first laser vision treatment developed in 1988 to permanently correct vision and today remains the preferred treatment option for patients whose corneas are too thin for Lasik. PRK differs from other laser treatments in that the treatment is applied directly on the surface of the corneaThe cornea is the clear, transparent 'front window' of the eye through which light enters the eye. It handles about two-thirds of the focusing power of the eye and is critical for good vision. See Info on Eyes – Anatomy.. The permanently reshaped cornea corrects the refractive error. Although the initial healing phase is significantly longer, the visual end-result is similar to LasikLasik is one of several types of laser treatments to permanently correct refractive errors of the eye. See Laser Vision – Introduction to Laser Treatment.. The name of this treatment may sound complex, but the treatment in itself is fairly simple. The first Photo Refractive Keratectomy (PRK) procedure was performed in 1988 and has proven itself to be safe, highly accurate and has yielded excellent results. In certain cases, like marginally thin corneas, PRK is still the preferred method of treatment. Click on this picture to see an animated illustration of PRK. Procedure: The epithelial layerThe epithelial layer is the thin, most superficial, transparent layer on the surface of the cornea. It has the ability to regenerate itself when damaged or removed. See Info on Eyes, Anatomy. on the surface of the cornea is removed whereafter the exposed surface of the cornea is reshaped with an excimer laserAn Excimer laser is a high-tech laser device used to permanently and very accurately reshape the curvature of the cornea to treat a refractive error or corneal pathology. See About Us – Our Technology – Excimer laser.. A 'bandage' contact lens is placed on the cornea to promote healing. After about 72 hours, when the epithelium has healed, the contact lens is removed. Since only the epithelial layer on the surface of the cornea is removed, there is minimal structural impact on the cornea. Note the 'bandage' contact lens on the cornea. Since PRK is a surface treatment, the biomechanical integrity of the cornea remains largely intact. Due to the simplicity of the technique, PRK is still the most economical option for corneal laser vision correctionLaser vision correction is a technique that has the ability to permanently correct refractive errors of the cornea by means of a laser treatment. Several types of laser vision correction treatments are available. See Laser Vision – Introduction to Laser Vision Correction.. The recovery period for stable vision is longer compared to other corneal laser techniques, with some discomfort during the first 72 hours. Because of the longer recovery time, we only treat one eye at a time, as you will need full use of your other eye while the treated eye heals. Vision may fluctuate for up to 3 months, since the healing process of the cornea takes some time. Moreover, the epithelium has to be polished by the continuous blinking action of the eyelids. However, after two weeks most of the healing has occurred and you can expect relatively stable vision thereafter. If a further correction is required, it should only be done after 3 months when vision has fully stabilised. When the procedure was first introduced in the late 1980s, there was a small risk of scar formation on the cornea if the post-operative instructions were not adhered to. However, due to improved surgical techniques, good aftercare, the use of prescribed eye drops and protection of the eye against harmful UV rays, this risk today is extremely small. LasekLasek is one of the older corneal refractive laser techniques which lost its popularity in favour of PRK, LASIK and SMILE. See Laser Vision – Lasek and Epi-lasik. is the acronym for Laser-Assisted Sub-Epithelial Keratectomy. Epi-LasikEpi-Lasik is a variant of the Lasik eye laser treatment, which we no longer use at Optimed. See Laser Vision – Lasek and Epi-lasik. is the acronym for Epithelial Laser-Assisted In Situ Keratomileusis. Lasek and Epi-Lasik treatments are slight variations on the same theme and differ only in the way they are executed. These treatment options are mostly chosen when a corneaThe cornea is the clear, transparent 'front window' of the eye through which light enters the eye. It handles about two-thirds of the focusing power of the eye and is critical for good vision. See Info on Eyes – Anatomy. is too thin or too steep for LasikLasik is one of several types of laser treatments to permanently correct refractive errors of the eye. See Laser Vision – Introduction to Laser Treatment..
With PRKPRK is one of the laser treatment options to restore vision by permanently reshaping the cornea with an Excimer Laser. See Laser Vision – PRK., the ultra-thin, outer layer of the cornea (epithelium) is completely removed from the surface of the cornea before the laser treatment is applied. With Lasek and Epi-Lasik the epithelium layer is removed and again replaced after the treatment. The permanently reshaped cornea corrects the refractive error. In practice, patients experience the procedure to be very similar to PRK. Although we have the technology to perform both Lasek and Epi-Lasik treatments, we rarely recommend them for a number of reasons. Although these procedures also have, like PRK, complex names, the procedures themselves are not. Laser-Assisted Sub-Epithelial Keratectomy (Lasek) and Epithelial Laser-Assisted In Situ Keratomileusis (Epi-Lasik) treatments are slight variations on the same theme and differ only in the way they are executed. These treatment options are mostly chosen when a cornea is too thin or too steep for Lasik. Click on this picture to see an animated illustration of Lasek. Procedure: As we have seen with Photo Refractive Keratectomy (PRK), the ultra-thin, outer layer of the cornea (epithelium) is completely removed from the surface of the cornea before the laser treatment is applied. With Lasek and Epi-Lasik the epithelium is removed and replaced after the treatment. Lasek: A very shallow D-shaped section is made in the epithelial layerThe epithelial layer is the thin, most superficial, transparent layer on the surface of the cornea. It has the ability to regenerate itself when damaged or removed. See Info on Eyes, Anatomy. only, so that the cornea itself remains intact. The area is then covered with a diluted alcohol solution to loosen the edges of the epithelium, which is gently lifted and folded to one side to expose Bowman's membraneThe cornea consists of 5 layers, of which Bowman's membrane is the very thin second layer. See Info on Eyes – Anatomy..
Epi-Lasik: A microkeratomeA microkeratome is a high-precision motorised scalpel used to make the flap for a corrective lasik treatment. is used to create the D-shaped epithelial flap. The loosened epithelial layer is gently lifted and folded to one side to expose the underlying Bowman’s membrane. An excimer laserAn Excimer laser is a high-tech laser device used to permanently and very accurately reshape the curvature of the cornea to treat a refractive error or corneal pathology. See About Us – Our Technology – Excimer laser. is used to sculpt the exposed corneal tissue. After the treatment, the epithelial flap is returned to its original position. A special contact lens, which is highly oxygen-permeable, is placed on the epithelial layer to keep it in place, to protect the surface of the eye and to allow the epithelial cells to grow back quickly. The healing process takes approximately 72 hours, after which the contact lens is removed. These procedures are a blend between PRK and Lasik and reduce the probability of complications, which the ophthalmologist may anticipate under certain circumstances during a Lasik procedure. In theory they offer less discomfort than PRK, but with the advantages of Lasik. In practice, the procedure is experienced to be very similar to PRK. The illustration below shows the procedure graphically which, as you will see, is very similar to the Lasik procedure described elsewhere. The only difference is the thickness of the flap and what it is composed of. A thin epithelium flap is made on the surface of the cornea and folded to one side. The exposed surface is reshaped by highly-accurate computer-controlled excimer laser pulses. The epithelium flap is replaced and a contact lens placed over the flap until the epithelium has fully recovered. The advantages and relative disadvantages of Lasek and Epi-Lasik are similar to PRK, so they are not repeated again. Since there is minimal advantage (if any) between PRK and these techniques, although we have the technology to perform these treatments, we rarely recommend them to patients. This section on Lasek and Epi-Lasik is therefore included for the sake of completeness, as well as for those patients who specifically request to undergo these procedures. LasikLasik is one of several types of laser treatments to permanently correct refractive errors of the eye. See Laser Vision – Introduction to Laser Treatment. is the acronym for Laser-Assisted In Situ Keratomileusis. This procedure was developed to correct spectacle errors in patients with impaired uncorrected vision. Because of its very high success rate, several millions of patients worldwide have had Lasik to date. A thin flap is created in the surface layer of the corneaThe cornea is the clear, transparent 'front window' of the eye through which light enters the eye. It handles about two-thirds of the focusing power of the eye and is critical for good vision. See Info on Eyes – Anatomy. and folded to one side. The exposed area is then reshaped by very accurately-targeted excimer laserAn Excimer laser is a high-tech laser device used to permanently and very accurately reshape the curvature of the cornea to treat a refractive error or corneal pathology. See About Us – Our Technology – Excimer laser. pulses. Complex mathematical algorithms guide the laser to remove microscopic amounts of corneal tissue at pre-determined positions on the cornea to correct its overall curvature. The flap is then replaced into its original position and re-attaches itself to the cornea over time. Since the curvature of the cornea is permanently reshaped, it corrects the refractive error. Different Lasik techniques are available to cater for different and unique patient conditions, and these are outlined further on. Lasik was first introduced in the mid-1990s and has proven to be a very popular laser refractive correction method. Since then, massive strides have been made in refining the procedure, which have resulted in the development of a number of variant techniques. These variants are classified according to the way the flap is made, as well as differences in laser profiles. Lasik, when first introduced, implied that the flap was made with a mechanical microkeratomeA microkeratome is a high-precision motorised scalpel used to make the flap for a corrective lasik treatment., a refined microsurgical instrument that utilises a high-quality steel blade to make a controlled surgical incision into the surface layers of the cornea. The operation of such a Microkeratome requires a certain amount of surgical skill. In the hands of an experienced surgeon, the quality of the flap is very similar to that created with a femtosecond laserA femtosecond laser is the latest high-tech laser device used to make extremely accurate corneal incisions. See About Us – Our Technology – femtosecond laser..
Click on this picture to see an animated illustration of standard Lasik. Femto-Lasik (or 'bladeless LasikBladeless Lasik is identical to standard lasik, except that the lasik flap is made by a femtosecond laser instead of a microkeratome. See Laser Vision – Femto-Lasik.') is a more recent advance and uses a femtosecond laser instead of a Microkeratome to create the flap. The femtosecond laser creates millions of tiny, micron-sized bubbles at pre-determined positions inside the cornea that gently separate the layers of corneal tissue. This creates a corneal flapA corneal flap is made with a microkeratome or femtosecond laser to perform a lasik treatment on a cornea. See Laser Vision – Lasik. of the desired thickness, size, orientation and location. This unprecedented level of control has allowed more patients to qualify for Lasik and virtually eliminates many of the complications associated with the mechanical approach. Apart from the difference in making the flap, Femto-Lasik is similar to standard Lasik. Its main advantage is that it brought a higher level of safety and precision to the Lasik procedure. Click on this picture to see an animated illustration of Femto-Lasik. The ablation profileAblation profile is the correction required on each point of a cornea to reshape its surface curvature to achieve the desired new shape of the cornea. of the laser treatment is optimised to maintain the natural characteristics of the patient's cornea before treatment. This leads to uncorrected vision which is similar to the visual experience of the patient with glasses or contact lenses before he/she underwent Lasik. This Lasik procedure optimises the ablation profile so that minimum tissue is removed from the eye, while maintaining a similar optical zoneThe optical zone defines the diameter of the laser treatment that is applied to the cornea. Its size may affect the quality and focus of the image that reaches the retina. compared to an aspherical treatment. This type of treatment is recommended for patients who have a large diameter pupil under low-light conditions, or patients who have a thin cornea. Up until the early 2000s, Lasik treatments were strictly based on a patient's optical prescription. The treatment did not take into account that each eye has a unique set of naturally-occurring optical imperfections, or higher order aberrationsA simple aberration is a distortion of an image caused by a lens and/or cornea, which could result in myopia or hyperopia. Higher order aberrations result from more complex distortions of the images due to multiple imperfections in the optical system of the eye.. This was known as 'conventional Lasik' and was to a large extent a 'one-size-fits-all' approach. With custom Lasik, topographyTopography is a term used to describe the surface characteristics of an object, such as the 'hills and valleys' of the surface. It can apply to a landscape or a cornea. and Wavefront devicesA wavefront device is used to accurately map the changes in the properties of light entering the eye due to imperfections in the optical system of the eye. The Zeiss Wasca Wavefront Analyser we use at Optimed measures up to 800 individual points within the pupil area that is visible through the cornea. These measurements can be used to make certain diagnoses, or can be passed to a laser, which may then use the information to reshape the curvature of the cornea to correct these imperfections. See About Us – Our Technology – Zeiss Wasca Wavefront Analyser. take detailed measurements to create a unique profile of each eye. These measurements are either topography generated Topography information, gathered by a corneal topographer (like the Atlas or Orbscan corneal topography systems), may be utilized to design a unique laser profile for an individual eye that will optimize the curvature of the cornea. , wavefront guidedWavefront information, gathered by a wavefront device (like the WASCA wavefront analyzer) may be utilized to design a unique laser profile for an individual eye that will optimize the curvature of the cornea. or a combination of the two measurements, which are then used to create a correction profile for each individual eye. It is like having a suit custom-made for you, rather than buying one off the shelf. Today, with the advent of topography and wavefront diagnostic technology, modern Excimer lasers can now treat each patient according to the uniqueness of his/her eyes and not just his/her prescription. Topography-guided treatments utilise the 3-dimensional corneal map of each eye to compute the optimal profile for that specific eye, whereas Wavefront technologyA wavefront device is used to accurately map the changes in the properties of light entering the eye due to imperfections in the optical system of the eye. The Zeiss Wasca Wavefront Analyser we use at Optimed measures up to 800 individual points within the pupil area that is visible through the cornea. These measurements can be used to make certain diagnoses, or can be passed to a laser, which may then use the information to reshape the curvature of the cornea to correct these imperfections. See About Us – Our Technology – Zeiss Wasca Wavefront Analyser. compares distorted waves of light exiting the eye to flat waves of light that would have returned in a perfect optical system. This information is converted by special software into a 3-dimensional map that serves as a guide for the Excimer laser to reshape the cornea. This procedure, therefore, creates a customised laser treatment profile that is unique for each eye. Results have shown that later Lasik procedures have reduced some of the unwanted visual effects associated with conventional Lasik, especially those associated with night vision, such as glare and halos. Custom Lasik has the potential to improve the quality of vision and to make patients see even better than they could with glasses or contact lenses. We are proud of the fact that we have several individualised treatment options available to suit the needs of our patients. Lasik is performed underneath the hinged flap of corneal tissue. A precision microsurgical instrument, known as a Microkeratome or a Femtosecond laser is used to create a flap with a total thickness of 120 microns (0.12 mm) on the surface of the cornea. The thickness, shape and dimensions of the flap are chosen in order to preserve the overall biomechanical stability of the cornea. The hinge of the flap ensures that part of the superficial corneal nerves remain intact, which is necessary to stimulate the production of tears to keep the surface of the eye moist. Once the flap is created and folded back, the exposed curvature of the cornea is reshaped by an excimer laser under precise computer control. The flap is then returned to its original position and re-attaches itself to the cornea over time without the need for stitches. The illustration below shows the procedure graphically. A laser or Microkeratome is used to create a 120 micron flap on the surface of the cornea. The flap is then folded to one side. The exposed surface of the cornea is reshaped by highly-accurate, computer-controlled excimer laser pulses. The flap is returned to its original position and re-attaches itself to the cornea over time. Note: Since the creation of a flap effectively reduces the thickness of the cornea, it may affect the biomechanical stability of the cornea. For that reason we avoid Lasik on patients with corneas that are less than 470 microns thick, to avoid future problems with stability. Lasik has been used since the mid-1990s and has produced excellent results. Femto-Lasik is a more recent variant and uses a femtosecond laser instead of a Microkeratome to create the flap, but in all other respects the process and results are identical. The procedure entails little, if any, discomfort. Functional vision returns very rapidly and, therefore, both eyes may be done in one session. Since a local anaesthetic is used, you may leave the clinic almost immediately after the procedure. Since a flap has to be created, Lasik and Femto-Lasik are more expensive than PRKPRK is one of the laser treatment options to restore vision by permanently reshaping the cornea with an Excimer Laser. See Laser Vision – PRK.. However, many patients are willing to pay the premium because of the many other advantages offered by this treatment. Should a further correction be required, a 3-month waiting period is advised. Some patients may experience 'dry eyesDry eyes are caused by insufficient natural tear production by the lacrymal glands around the eyes. See Eye Diseases – Dry Eyes.' and/or halos around bright lightsAfter a Lasik treatment, some patients may see halos around bright lights at night. This is a temporary condition, which in most cases disappears after 3 to six months.. In the vast majority of cases both these phenomena subside after approximately 3 months. In rare cases there may be potential flap complications. However, good aftercare, adherence to the doctor's instructions and use of the prescribed medication minimises the risk. ReLExReLEx is an acronym for Refractive Lenticule Extraction. See Laser Vision – ReLEx – Flex and Smile. is an acronym for Refractive Lenticule Extraction, a proprietary term used by the German company Zeiss to describe their very latest laser techniques to correct refractive errors in eyes. The two new techniques were first introduced in 2009 and both are carried out by the Visumax femtosecond laserA femtosecond laser is the latest high-tech laser device used to make extremely accurate corneal incisions. See About Us – Our Technology – femtosecond laser..
FLExFLEx is one of the the latest techniques to restore vision by permanently reshaping the cornea with a femtosecond laser. See Laser Vision – RELEx - FLEx. is identical to LasikLasik is one of several types of laser treatments to permanently correct refractive errors of the eye. See Laser Vision – Introduction to Laser Treatment., except that the entire procedure is performed with a femtosecond laser. In one pass, the laser first creates a precisely-shaped lenticuleA lenticule resembles a very thin contact lens and is formed within submicron accuracy inside the corneal stroma with a femtosecond laser. It may be removed through a very small incision on the side of the cornea, or from the corneal bed under a flap, depending upon the technique employed by the surgeon, which then achieves a refractive correction on the cornea. See About Us – Our Technology – Zeiss Femtosecond Laser. in the upper layer of the corneaThe cornea is the clear, transparent 'front window' of the eye through which light enters the eye. It handles about two-thirds of the focusing power of the eye and is critical for good vision. See Info on Eyes – Anatomy. and immediately proceed to make the flap on top of the lenticule. The shape of the lenticule is similar to a thin contact lens and its dimensions are within sub-micron tolerances of the correction required. After folding the flap to one side, the lenticule is manually removed and the flap is laid back into its original position, where it re-attaches itself to the cornea over time. Since the curvature of the cornea is permanently reshaped, it corrects the refractive error. SmileSmile is the latest and most modern laser technique to restore vision by permanently reshaping the cornea with a femtosecond laser. See Laser Vision – RELEx - Smile. is an entirely new and innovative procedure that is also performed with a femtosecond laser. In one pass, the laser first creates a high precision lenticule within the cornea, followed by a small incision in the periphery of the cornea. The shape of the lenticule is similar to a thin contact lens and its dimensions are within sub-micron tolerances of the correction required. The lenticule is freed and removed through the small incision. Since the curvature of the cornea is permanently reshaped, it corrects the refractive error. Procedure: In one pass, the Femtosecond laser first creates a precisely-shaped lenticule in the upper layers of the corneal stroma and immediately proceeds to make an overlying lamellar flap of desired thickness similar to, but not as large as, a Lasik flap. The shape of the lenticule follows the contours of a thin contact lens and its dimensions are within sub-micron tolerances of the correction required. The flap is lifted, the lenticule is removed and the flap is returned to its original position, thereby correcting the refractive properties of the cornea. FLEx differs from Lasik in that the femtosecond laser first creates the lenticule and immediately thereafter the flap – all in one pass. The change in corneal shape is achieved by surgically removing the redundant tissue, instead of evaporating it with an Excimer laser. With Lasik, a flap is first created and then the excess corneal tissue is evaporated in a pulse-by-pulse fashion by an excimer laserAn Excimer laser is a high-tech laser device used to permanently and very accurately reshape the curvature of the cornea to treat a refractive error or corneal pathology. See About Us – Our Technology – Excimer laser.. The illustration below shows the FLEx procedure graphically. The femtosecond laser creates a lenticule and flap in the cornea. The flap is folded to one side, exposing the lenticule. The lenticule is removed from the exposed cornea. The flap is returned to its original position and re-attaches to the cornea over time. Click on this picture to see an animated illustration of FLEx. Both eyes may be done in one session. The procedures use a pre-programmed femtosecond laser instead of a microkeratomeA microkeratome is a high-precision motorised scalpel used to make the flap for a corrective lasik treatment. to create the flap, with a very high safety profile and accuracy. Should there be any complication during the laser treatment (e.g. suction loss of the patient interface, which links the patient to the laser), the procedure may be temporarily suspended and no harm will be done to the cornea or eye, since no conventional incisions were made. Functional vision takes a little longer to return compared to Lasik. As an expensive femtosecond laser is required for the procedure, this procedure is more expensive than Lasik. Some patients may experience dry eyesDry eyes are caused by insufficient natural tear production by the lacrymal glands around the eyes. See Eye Diseases – Dry Eyes. and/or halos around bright lightsAfter a Lasik treatment, some patients may see halos around bright lights at night. This is a temporary condition, which in most cases disappears after 3 to six months.. Both these phenomena subside after approximately 3 months in the majority of cases. Smile is the latest laser technique. It introduces new levels of precision and several unique characteristics, as well as the established benefits of Lasik. Procedure: In one pass, the Zeiss Visumax femtosecond laserThe Zeiss Visumax femtosecond laser is an extremely high-precision, state-of-the-art laser device used to make incisions into the eye. See About Us – Our Technology – Zeiss Visumax Femtosecond Laser. creates a precisely-shaped lenticule within the upper layers of the corneal stroma, followed by a small 3 to 4 mm incision on the side of the cornea. The shape of the lenticule is similar to a thin contact lens and its dimensions are within sub-micron tolerances of the correction required. Thereafter, the surgeon frees the lenticule and then removes it through the small incision, changing the corneal curvature and correcting the refractive error with minimal intervention. The illustration below shows the Smile procedure graphically. A femtosecond laser creates a lenticule inside the cornea, which corresponds exactly to the correction required. The laser then creates a 4 mm incision on the side of the cornea, through which the lenticule is manually extracted. Because the incision is so small, it heals quickly and the structural integrity of the cornea is largely preserved. Click on this picture to see an animated illustration of Smile. The visual outcome is similar to that seen with Lasik and Photo Refractive Keratectomy. The risk of flap complications is negated, as there is no flap. The risk of infection is extremely small, since the only portal for entry of organisms is the small 3 to 4 mm incision as opposed to the whole edge of the flap in Lasik and FLEx. The integrity and biomechanical stability of the cornea is largely preserved, which means that your corrected vision should remain stable for many years. The procedure has excellent predictability, even for high levels of myopiamyopia is also known as nearsightedness. It results from an eye that is larger in size compared to a normal sized eye and/or a cornea that is relatively too steep, causing the image to focus in front of the retina instead of on the retina itself. See Info on Eyes, Optics and Refractive Errors - myopia.. Therefore, the need for a second procedure to enhance the first is rare. Because most of the corneal nerves remain intact, patients generally experience less 'dry eyes' compared to Lasik. It made laser vision correctionLaser vision correction is a technique that has the ability to permanently correct refractive errors of the cornea by means of a laser treatment. Several types of laser vision correction treatments are available. See Laser Vision – Introduction to Laser Vision Correction. possible for some patients who would previously have been regarded as unsuitable candidates. The unimaginable precision of the equipment. The extremely good visual results. The considerably more freedom without visual aids. The ability to practice professions, hobbies and sport without restriction. Smile is a relatively new procedure. 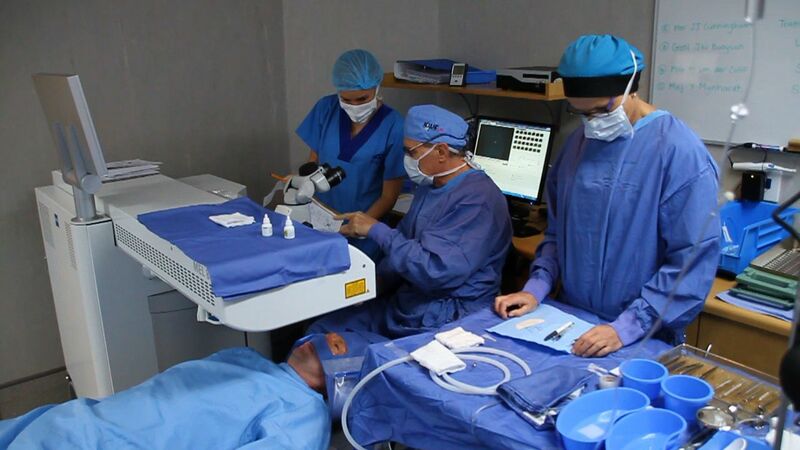 As at January 2013 there were only approximately 40 centers worldwide able to perform Smile procedures – Optimed Eye and Laser Clinic being one. However, surgeons who use this procedure and patients that have undergone this treatment are generally very happy with the results, as outlined above. Because of its extremely high precision and sophistication, Femtosecond laser equipment is considerably more expensive than excimer lasers, which affects the cost of a Smile treatment. Many patients nevertheless regard its advantages sufficiently important to choose it instead of one of the other laser alternatives.